The first in a series of Yiddish polemical pamphlets (Diskursn) appeared one week before the elections to the second National Assembly in the Republic of the Netherlands on August 1, 1797. Inspired by the expanded freedom of the press and the satirical and often vulgar Spectatorial writings which were popular at the time, a small but energetic group of enlightened Jews in Amsterdam decided the previous summer to publish a periodical. These Yiddish polemical pamphlets would serve as an informative and propagandistic vehicle through which members of the new community could anonymously persuade the Jews of Amsterdam to choose the party of progress and enlightenment. The author or authors inveighed strongly against the alleged abuses in the established community and those they held responsible, the parnosim (board of directors) and their officials. In order to reach the Jewish masses in a city with about 20,000 Ashkenazic Jewish inhabitants, the reformers chose to write the Diskursn in Amsterdam Yiddish. Their efforts were so successful that the established community thought it necessary to enter the fray by publishing its own version of a thirteenth installment shortly before the thirteenth installment of the original series was due to appear. From then on, two series of Diskursn competed for public favor. Using criticism, salacious gossip, slander, and accusations, the same three or four main characters and a few secondary ones railed against the excesses and foibles of the other community. Both series ended after the parnosim of the old community were deposed in the early spring of 1798. By then, 24 Diskursn from the new community and 11 from the established community had appeared, together more than 500 printed pages. Of course we cannot judge the two communities fairly based on the texts of the Diskursn. Both sought to discredit their opponents with stories of whores, sexual scandals, illegitimate children, hypocrisy, religious violations, bankruptcy, and fraud. 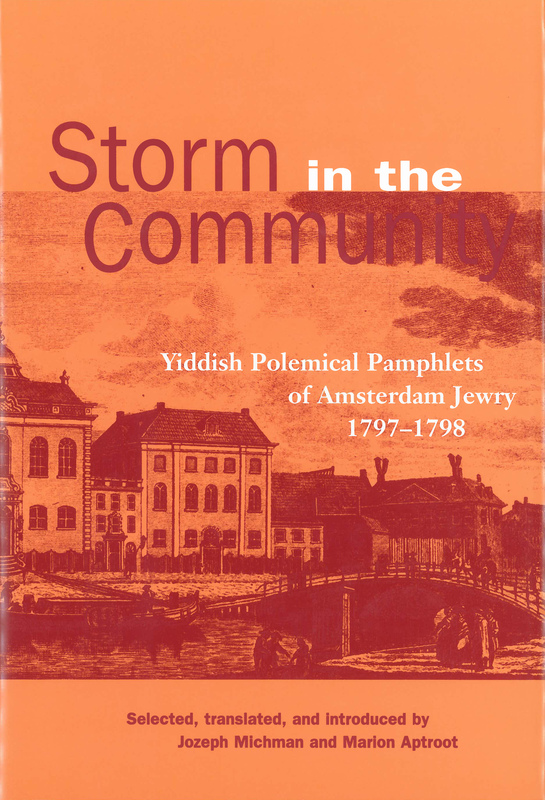 Nevertheless, the pamphlets describe the environment of Amsterdam Jewry and reveal what interested those Jews and how they responded to revolutionary changes. All of this is depicted by inventive authors who came up time and again with different, often humorous settings for their volleys of curses and torrents of abuse. These Yiddish polemical pamphlets are a rare phenomenon, not just in the history of Jewish communities in the period of emancipation, but in the histories of Yiddish literature and satirical/polemical periodicals as well. This is the first-ever bilingual edition of a major portion of this collection of documents and the first time any of them have been published in English translation. A lengthy introduction and five appendices help the reader understand and appreciate these colorful Dutch Jews and their often impassioned arguments. Jozeph Michman is the founding director of the Institute for Research on Dutch Jewry, Dinur Center, Hebrew University of Jerusalem. Marion Aptroot is Professor of Yiddish Culture, Language, and Literature at the Heinrich Heine University in Düsseldorf, Germany.